This large, sloping property near Coos Bay, on the Oregon coast, has a stunning view of the bay and bridge. Despite the obvious advantages, the site presented a number of challenges. The large, open space lacked organization and even outdoor living areas. The plant palette is limited by voracious deer and intense south storm winds, which are strong enough to blow some plants out of the ground. Our clients discovered our work in Fine Gardening and were drawn to the strong, classical lines and full plantings of our personal garden. With their big family and tight-knit church community, their garden needed to be ample and useful for a variety of activities and groups. 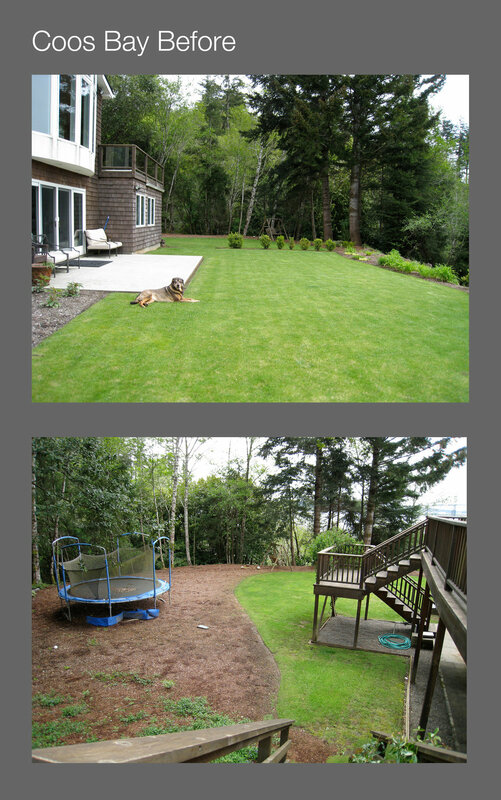 In Mosaic’s landscape design, two large lawns and a meadow give kids room to run. Within the ornamental garden, we created paths and seating areas to accommodate a variety of group sizes and moods. Three popular areas are an ipe bench below an arching pear arbor, a back terrace overlooking the bay, and a fire pit area that can accommodate a crowd. The balance of open space and layered, intimate plantings reflects the warmth and welcome of the family's home and lifestyle. Our initial plantings gave the garden a strong deer-resistant foundation, but the deer "refined" the palette over time. We have amended the plantings to reflect their tastes, especially along the most frequently traveled routes, and the deer rarely damage the plantings now. In anticipation of strong winds, we emphasized deciduous plants and low, tough evergreens in the windiest areas, with the notable exceptions of Phormium and Picea sitchensis 'Papoose,' both evergreens of medium height that thrive in their native coastal habitats.